From buying insurance policies to installing security cameras, you take every possible step to protect your business from disaster. But you power on your computer and are met with a screen that claims to have encrypted all of your files. Unless you pay a fee before the timer expires, the program will delete your files forever. Although each situation will be different, this is what will likely happen when ransomware strikes your business. If you store your customer data, tax information, contracts or any other important files on your network, your business can suffer. Not only will ransomware lock your files, but it can also destroy your reputation if your customers find out that your servers are not secure. When the future of your business is on the line, you can’t afford to leave yourself exposed to the threat. Criminals and hackers will use a range of tactics to infect a business or organization with their malicious software, including sending an email containing an infected link to one of your employees. The infected email can even be made to appear as if it came from one of your company’s email addresses. The moment your employee clicks on the link, the ransomware will jump into action and hold your files hostage. Also, if a member of your team is infected at home and brings a flash drive to work, you could have a problem on your hands. Teaching your employees how to stay safe online is one of the top ways to protect your business from such attacks. If you want to avoid taking unneeded risks, prevent your employees from using personal devices on your network. Ensure that each person who works for you knows not to click on links unless they are sure that no danger is present. When someone from your company sends an email, have your team call the person to confirm that the email is legitimate. In addition to showing people how to stay safe when they use your network, consider putting policies in place to add an extra layer of protection. Ransomware can easily spread across your office network, encrypting and possibly deleting all of your company’s files. 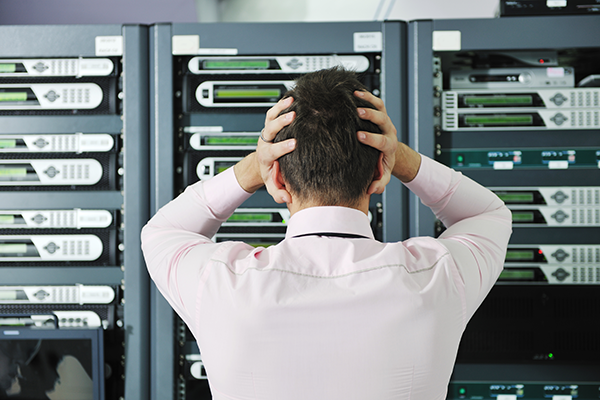 If you want to do everything that you can to avoid such a disaster, consider getting an off-site dedicated server or cloud backup solution for your business. Doing so will allow you to store copies of your files outside of your infected office network, so that you can recover them after an attack. One thing to keep in mind when searching for a cloud backup provider is storage limits. If your business has a large amount of data that will need to be backed up into the cloud, consider looking for a provider that offers an unlimited storage option. No matter how prepared, you can never totally eliminate the threat of ransomware. Even if you have taken the step to backup all of you company’s critical files, you can still be left with the daunting task of restoring all that data as well as needing to recover your company’s entire IT infrastructure. This is where Disaster Recovery as a Service or DRaaS comes in. With a DRaaS solution, you can have a complete backup of your business’s vital IT infrastructure at an off-site datacenter. Entire operating systems, whether it be physical or virtual, databases or individual files and folders can all safely and securely be replicated to a datacenter. Data can then be securely pushed back down to your office location, or it can even be restored into a virtual cloud environment, utilizing Cloud Replication. DRaaS solutions that feature Cloud Replication allow for the restoration of data to a virtualized server. Utilizing an off-site datacenter’s cloud infrastructure, data can be made available instantly, then accessed remotely from anywhere in the world over multiple, redundant, high speed networks. This removes the bottleneck of local internet service providers bandwidth availability, and saves potentially hours of business critical time by bypassing the need to wait for your onsite systems to restore and be back in working order. Should a disaster occur in which your infrastructure is no longer available or accessible to be restored, the need to purchase new hardware can be completely eliminated. Utilizing a DRaaS solution can have your business back online in minutes, not days. Employees can continue their work from home, remotely accessing images of their old workstations running live in the cloud, ensuring your business does not skip a beat. TurnKey Internet is Upstate New York’s only Tier IV featured Data Center providing 100% Guaranteed Uptime. We offer Colocation, IT Infrastructure, New York to California replication, on-premise 24×7 expert local staff, and the Cloud solutions to help your business succeed. TurnKey’s DRaaS (Disaster Recovery as a Service) solution offers live Cloud Replication for your on-premise IT infrastructure to our Tier IV featured Data Center in a secure virtualized hybrid environment that is instantly available and securely accessed remotely from anywhere. Don’t gamble, call TurnKey Internet at 518-618-0999 or visit turnkeyinternet.net/myplan to receive a FREE consultation of your company’s Disaster Recovery Plan. « What is the Difference Between SSAE 18 and SSAE 16 vs SAS 70 Standards?